In his art gallery, which inhabits a small brick house at 64th and Dorchester, originally purchased by his grandfather in 1946, artist William Hill, a co-curator of the Experimental Station showcase “Environmental Concerns,” explained the project’s concept. “I wanted more of a local-global experience, where we would concentrate on youth and communities in underserved areas of the city within the parameters of Englewood, Woodlawn, and South Shore,” Hill said. He contacted art instructors at Hyde Park Academy High School, artist Gerald Sanders, and others to participate in the showcase. Sanders, who teaches art at his Bronzeville studio, contributed his own and his students’ paintings to the exhibit at Hill’s gallery, one of four physical spaces “Environmental Concerns” is inhabiting and connecting in the project. The paintings explore themes of environmental degradation, animal population dynamics, and humans’ impacts on natural spaces. In one watercolor, a Bengal tiger, sharply in focus, considers a blurry reflection of itself in a stream. In another painting, scrawny trees peek out from a landscape crowded with shotgun houses. Artists in multiple disciplines from across the city contributed to the showcase. Rhonda Ghoulston’s students at Hyde Park Academy made papier-mâché animals for a “Zoo of Endangered Animals.” Sound artist Norman Long led guided sound walks that explored how the soundscape in the neighborhood around the Experimental Station defines the experience of moving through it. Alpha Bruton, an art consultant and chief curator for the Phantom Gallery Chicago, created an art installation that hangs in the Experimental Station’s foyer. The piece incorporates projected slides, sound elements, computer monitor shells, shards of mirrors, and other found objects. When she began conceptualizing the installation, she considered different ways of entering the space as well as questions around technology as a source of physical and mental pollution, Bruton told the Weekly. She collected some of the installation’s components, and Hill alongside Experimental Station assistant director Matthew Searle provided others. “All the things that are in the installation have to have a story of where they came from and why they’re purposed,” said Bruton. The monitor shells represent her concerns about our reliance on the internet. “Even now, we have little kids that are plugged into their iPhones,” Bruton said. “These monitors were precursors to this little phone.” The monitors hang amid triangular shards of former mirrors. That element reminds the viewer to reflect on how humans have treated the environment. “What’s our legacy, what are we going to pass on to our grandchildren?” she said. In addition to site-specific art installations, the “Environmental Concerns” showcase has also incorporated public events. One of those events, on October 13, gave shoppers at the 61st Street Farmers Market (also run by the Experimental Station) the opportunity to bury their fears—literally. Artists from Cream Co., a Pilsen-based art collective that creates interactive installations to explore alternative, sharing-oriented economies, hosted an interactive event titled “Plant Your Fears,” which invited market attendees to write down their sources of fear on slips of paper that the artists wrapped around allium and fritillaria bulbs. The artists later planted the bulbs at the nearby Woodlawn Botanical Nature Center, which Hill also manages. “The intention was to create the art around the experience rather than the product,” Brett Swinney, a project manager at Cream Co., told the Weekly. “I think we always struggle with our fears—just personally we always have these things, and we always kind of feel the need to expel them without really thinking about putting them to use.” Whatever someone’s background, they would be able to contribute something that would take on a transformed nature as it grew into a garden, he said. The artists chose bulbs that have been described by writers and on gardening websites with fear-provoking words. They found that allium plants, for example, have been variously called unpredictable, zealous, clingy, aggressive, wild, and persistent. Participants offered a variety of fears to be buried. Climate change featured heavily, as did what Swinney called the “heavy hitters”: dying alone, death, and loneliness. The bulbs will spend the winter underground. “In the late spring, we should have a fear comfort garden,” Earle said. What Makes an Art Collector? At a well-attended public conversation, Kahari Black, co-director of the Youth/Police Project at the Invisible Institute (another tenant of the Experimental Station) and a visuals contributor to the Weekly, discussed environmentalism, art, and Woodlawn’s history with Patric McCoy, a longtime EPA scientist and a cofounder of Diasporal Rhythms. Through the organization, McCoy collects, promotes, and preserves art from the African diaspora. McCoy, who grew up in a two-room apartment in Woodlawn, began collecting art when he purchased a lithograph from his college roommate for ten dollars. In his home gallery McCoy now has over 1,000 pieces of fine art, the majority of which are by Chicago artists. But for many years, he never considered himself to be an art collector. McCoy told the audience that there are implicit barriers that prevent most people, himself included, from thinking they can access the art world. “We tend to think immediately when you say ‘art collector’ that the person is super-wealthy,” McCoy said. This reinforces the notion that art is for the ultra-rich, he explained, and it tells the average person art isn’t for them. Another assumption is that art collectors “squirrel away their art and hide it,” he said. He also believed that he had to be “academic” and “encyclopedic” about art to be a collector. “I’d never taken an art history class,” McCoy said. Finally, the idea that fine art is an investment, in which every purchase must lead to future value, was not something he agreed with. “So I had four strikes in my head that were keeping me from thinking I was an art collector,” he said. McCoy said he had an epiphany when he started considering other cultural touch points such as music, poetry, or fashion. “I thought, well, everybody is a music collector in some way, shape, or form,” he said. “And the first thing you do in your music collection is you want to share it. So I said, you don’t have to be wealthy; you clearly share this thing; and you don’t have to know a thing about music to like it and acquire it; and you don’t think of it in terms of investment.” These things all happen in the art world, but not in other cultural spheres, he said. 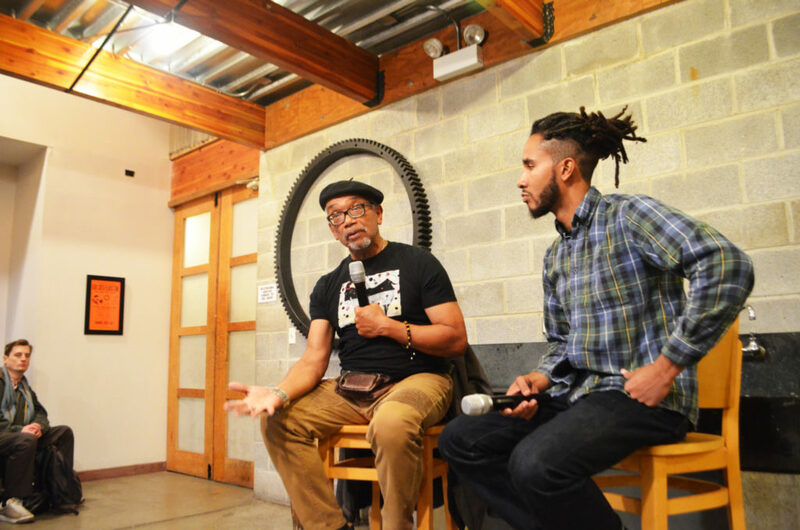 McCoy and Black also discussed the history of the Black Arts Movement, how the environmental movement impacted national and local policy, and the relevance of both struggles today. He said he’s almost resigned to the idea that things will get worse before they get better. Just almost: “But I’m an optimistic person, I believe it can turn around,” he said. Editors’ Note: The Weekly is a tenant of the Experimental Station (come visit our newsroom! 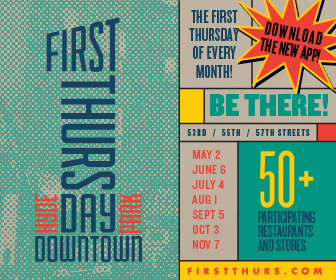 ), which also serves as our nonprofit fiscal sponsor. The closing event of “Environmental Concerns” will be held Tuesday, November 13, from 6pm–7:30pm. Participants will ceremoniously remove the art installation “Solo Saw,” a double-chainsaw creation by Erik Peterson, from its perch on a ledge inside the Experimental Station. The send off will feature performances, tastings, and sensory stimulation for guests. Searle plans to bake bread, and volunteers will make jams, jellies, and compotes to share. Jim Daley is a contributor to the Weekly. He was raised in Beverly and deeply loves the South Side. A former biologist, he writes about intersections between health, environment, science, and community. He last wrote about Pilsen gym Healthy Hood for the Weekly’s Best of the South Side issue.